When I was a post-bacc student, I ate nearly the same thing every day for breakfast: an overnight oat/chia combination with dried fruit and hemp protein. It was nutritious, fast, and filling. One downside, though, was that it was cold, which wasn’t always welcome in the winter months. 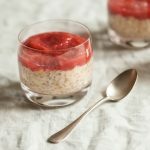 At this time of the year, I’m always on the hunt for breakfast options that are as portable as chia pudding or as quick as a smoothie, but which offer warmth and heartiness. 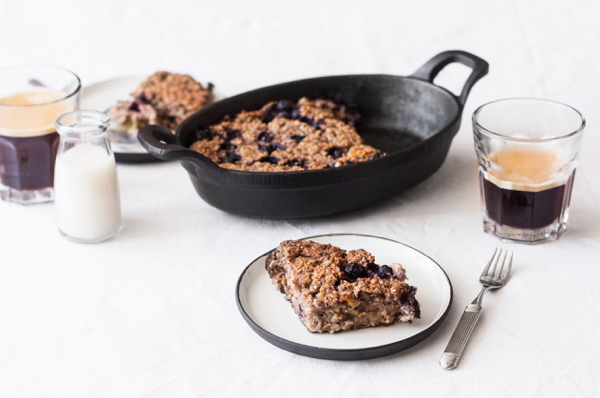 This blueberry, banana, and walnut oat bake is a perfect solution. In fact, baked oatmeal may become my thing this winter. Sure, there’s some advance prep involved, but once the oats are baked, you’ve got at least four easy breakfasts ahead of you. The baked oats will turn firm enough to resemble a bread (see above), but if you microwave them or heat them on the stovetop, you can serve the baked oats in a bowl, and top them with maple syrup. 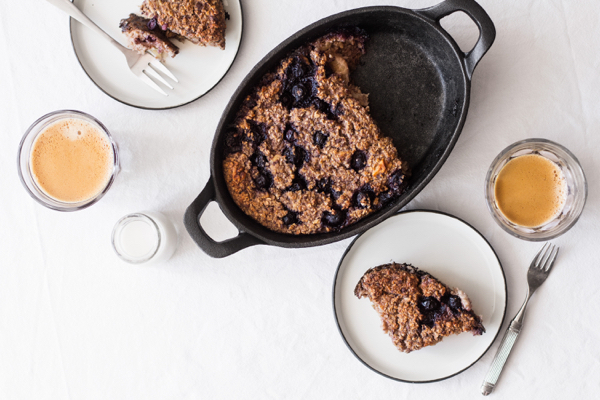 It’s a perfect compromise between a breakfast quickbread and a hot porridge. No matter how you enjoy these oats, they are truly delightful. They’re healthful, too, sweetened primarily with fruit and studded with walnuts, which provide plenty of awesome Omega-3 fatty acids. No blueberries in winter? No problem. I developed the recipe with frozen ‘bloobs, and they worked perfectly. Oil an 8 x 8 baking dish and preheat the oven to 350F. Mix the oats, salt, cinnamon, ginger, and flax together in a large mixing bowl. Fold in the frozen berries. banana, and walnuts. Blend together the almond milk, remaining banana, and sweetener. Pour the liquid over the dry ingredients and mix well. Transfer the whole mixture to the baking pan. Bake the oats for 40-45 minutes, or until the top is browning and firm. Allow the oats to set for at least thirty minutes before cutting into servings and enjoying. Leftover baked oats will keep in an airtight container in the fridge for up to 5 days. If you're allergic to gluten, be sure to use rolled oats that are certified gluten free. To give the bake even more character, serve it with a schmear of fruit preserves, apple or pumpkin butter, or almond butter. 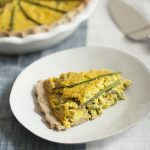 Perhaps you’ll enjoy this warming breakfast on Christmas morning or New Year’s day this year–or perhaps you’ll tuck the recipe in your back pocket to enjoy for the remainder of winter. I’ll be enjoying it along with you. I’ll be having a quiet Christmas with Steven, my mom, and friends. But on Friday morning, Steven and I will be on our way to Vieques, where my college BFF is getting married this coming weekend. I can’t wait to celebrate with her! The blog will likely be quiet until Sunday, but I’ll be checking in while Steven and I enjoy some vacation time in paradise next week. As always, it’ll be fun to share my travel adventures with you all. I had everything I needed for this but the right sized pan, so I poured the mixture into a 12 cup muffin pan and they came out great. I’m wrapping some individually and sticking them in the freezer for quick breakfasts. Perfect bake recipe for these cold winter months. Yum! Wishing you a very Merry Christmas, Gena! Looking forward to your recaps, as always. A belated Merry Christmas Gena! Hope you had a lovely, relaxing day. This recipe looks perfect. I’ve been looking for more ideas for quick/pre-ahead breakfasts now I’m working full time and this definitely fits the bill. I have a load of blackberries in the freezer leftover from early autumn foraging so I think I’ll swap them in for the bloobs. Excited to try it! Blackberries sound like a great addition! I hope it turns out well. Oats are the best! Enjoy the recipe. Fantastic idea! I *love* overnight oats and smoothies in the spring, summer & even fall. I try to love them in the winter, but have been having a bit of a hard time with cold things as the weather has cooled off. This sounds so good! 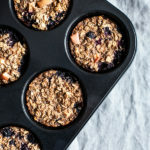 I just tried this in the morning, and I love the fact that it’s so versatile, all kinds of berries fresh for whatever season your’e in can be added, it was absolutely delicious and kept me feeling full well into the late afternoon. Love all of these things! Thanks for trying the recipe. 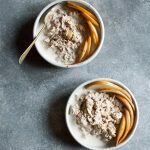 I need to eat more oats, and this recipe look absolutely perfect to do so, I’m going to have to give this a try! Just finished a slice and OMG this is fantastic. Love it. Thank you for sharing. Yay! So glad you like it. Yum! Looks delicious, and perfect for a chilly morning! Hi Gena, I made this recipe this morning and it was wonderful. I didn’t have blueberries so I subbed frozen raspberries. Thank you so much for sharing! So happy that you loved the recipe! Gena, I just have to come back and tell you how wonderful this recipe is. I love baking it the day before and letting it set up in the fridge so it gets firm almost like a cake. And topped with roasted almond butter just takes it over the top. For anyone wondering, once its set up firmly, you can freeze them into individual portions for busy mornings. Thank you for this perfectly timed post! I made a double batch of this last weekend, and it’s made for several quick and easy breakfasts for ourselves and guests while on vacation. I wasn’t sure which kind of oats to use, so I went with quick oats. They worked fine, but I think I’ll try it with classic rolled oats next time for a little more texture. We’ve especially liked it warmed up with a little margarine on top, and I’m eager to try it with other mix-ins, like rhubarb and cranberries. I’m so happy that you like it! It’s definitely delicious with a pat of Earth Balance. I look forward to a spring variation. I made this for a ladies brunch recently and it was a big hit! Very simple to pull off for an early morning get together & yet so hearty and satisfying. Great as a leftover as well! I think I’ll have this as part of my regular rotation for quick breakfasts throughout the week. Delighted that it was a success, Stacy! Hooray. I love this recipe! I’ve made it four or five times since you posted it. 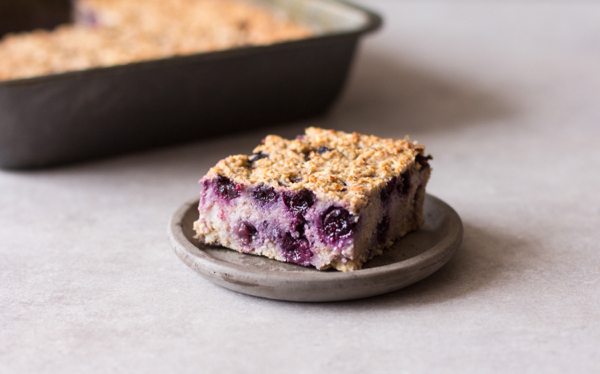 When I first made it, I didn’t have blueberries or walnuts (more more than one banana for that matter) but the rest of the recipe served as a perfect template and I just topped it with fruit and things I did have. Delicious! Bookmarked this one and only just got round to trying it. Wish I hadn’t waited so long! Really nice. Roll on breakfast time. .. I have a few questions though; I wanted to put in some expresso grounds and take out the blueberries to make a coffee oatmeal square. Also, could I sub honey instead of maple syrup? I made this for my husband and he loves it!! I am wondering if you have the nutrition information. He was is keeping a food journal for a health issue. Ah, I don’t have it, Nancy. I don’t calculate for the blog, but you can definitely try using a program like MyFitnessPal to log the information. I’m so glad you like the recipe! Looks so good. Do you think I can leave out the flax? Maybe use chia or hemp hearts instead? I can’t have flax right now. Absolutely! Ground or whole chia seeds are a good substitute. OK thank you! Going to make this for me and my 17-month old!